This Soil Types and Water Retention Experiment will allow students to take a closer look at the properties of soil types such as gravel, sand, potting mix and clay. 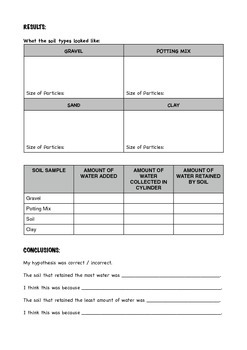 Students will discover what properties of soil are needed in order to retain water. A follow up experiment would be the Mrs Carters Classroom Erosion Experiment. Through completing the worksheet, students will be asked to list their hypothesis, identify any variables, record their results and draw conclusions. 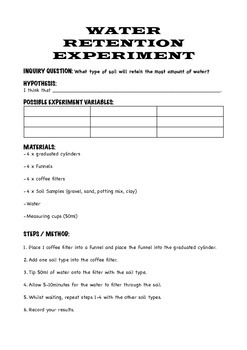 The activity lists all of the materials and the method required to complete the experiment.